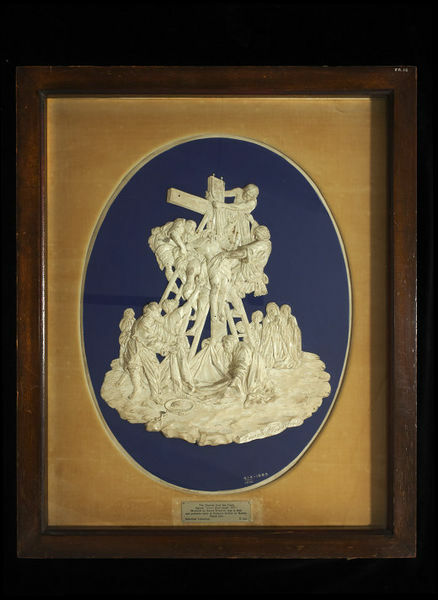 Plaque of white earthenware faced with blue in imitation of Wedgwood's jasper ware, and with a white glazed relief of a version of 'The Descent from the Cross'. The body of Christ is supported by five men, and at the foot of the Cross are two others holding open a fringed winding-sheet. On the ground are nails and a sponge in a bowl, and in the background to the right are the three Maries. At the top of the Cross is the inscription on a scroll 'JESUS OF NAZARETH KING OF THE JEWS'. Bought in London, September 1884. The image on the plaque is based on a painting in the Louvre 'La Descente de croix' (1697) by Jean Jouvenet, who was a Rubenist. A copy of this painting, now at Wednesbury Parish Church, was previously at West Bromwich or Walsall in Staffordshire and was apparently reproduced in engravings (see letter to the Editor, Apollo, June 1954). 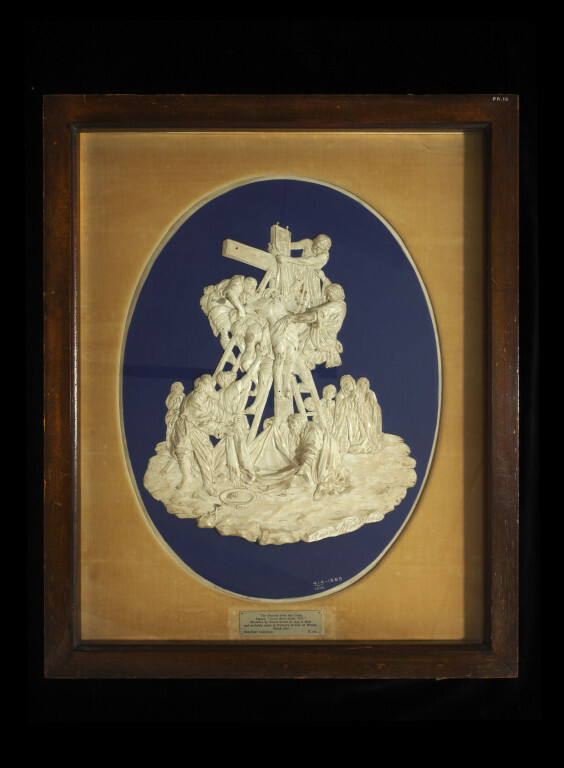 Plaque of white earthenware faced with blue and with a white glazed relief of 'The Descent from the Cross', modelled by Enoch Wood in 1777, made by Enoch Wood & Sons, Burslem, ca. 1825. Horne, Jonathan. A Collection of Early English Pottery, London, 1998. No. 540. See Object Information file in Ceramics and Glass offices.